Today’s article is longer than usual (1,150 words) but it’s worth big money to most families. I’m going to run through how you review a property investment. I use a version of this template for every property deal that I consider. I make the cost of property ownership visible to my family. This habit keeps me from buying too large a property, or leaving valuable assets empty most of the year. If you can’t calculate the sums before you buy then wait. If you remember one thing from this article… act as if you will “lose” 10% of your purchase price the day you buy. First: Calculate Net Realizable Value – What Happens If You Sell? Start by coming to a view on current market value. To estimate market value, lay out the different options available. Be conservative, I’ve been known to fool myself with a dream value that has no chance of being realized. The tax basis of the property is your allowable cost, plus additions that are capitalized, less depreciation that you’ve taken against your taxes. When you buy a property, you have to allocate the cost between buildings (depreciable) and land (not depreciable). I usually use the appraisal that was done at the time of purchase, or figures from the county assessor’s office. With this property, I know that the owners checked with local real estate agents and applied a discount to what the agents told them. So, for the purposes of this exercise, I’m going to use the Owner’s Valuation of $925,000. When you sell, you don’t get the gross value. I account for sales expenses by taking 94% of the gross value. In our example, that leaves $869,500 (94% of $925,000). The next step is to strip out any capital gains tax that would be payable. In this case, I know the family has an effective capital gains tax rate of 25% (including State). So we take the net price ($869,500) and deduct the taxable basis ($792,772) to get the taxable gain of $76,728. Taking 25% of the gain gives a capital gains tax liability of $19,182. So the net realizable value for the property is $869,500 less $19,182 => $850,318. Note that the net realizable value is FAR LESS than the gross value. Rule of thumb: the market usually needs to rise 10% for you to get your money back. I assume that I lose 10% of the purchase price on the day I buy. This assumption makes me reluctant to buy, which has saved me from many poor investments! As an asset class, real estate is costly to own, illiquid and expensive to sell. Do your sums before purchasing. For the next bit, you probably want to print the article out, grab a pencil and make notes for your own property. If you can’t handle the pencil/paper method then this is a link to a spreadsheet that will do the calculations for you – make your own copy and fill in the Blue Cells. A picture of the spreadsheet is below. Start with your net income after all expenses and depreciation. If you live in the US then pull up your Schedule E and look on Line 21 – in this case the net income was $4,476. I recommend separate bank accounts for your main house expenses and any property investments. This makes it easier to track expenses by property. To calculate cash flow before interest, we need to add back interest – Line 12 in the US – $9,375. At this stage, I like to make a note about the total debt outstanding and the interest rate you pay – in our example the debt is $250,000 at a rate of 3.75%. Remember that you only want to count interest paid, not principal repayments. Revenue Less Expenses ($4,476), Add Back Interest ($9,375) gives you $13,851 of profit before interest expense. Because depreciation is a non-cash expense, you add depreciation back to calculate cash flow before interest and depreciation. In the US see Line 18 – $14,160 for this case study. So the total net cash flow (before interest and depreciation) is $13,851 + $14,160 = $28,011. To check the gross cash yield on the property you divide cash flow before interest and depreciation by the gross net realizable value. $28,011 / $850,318 = 3.3%. 3.3% is the gross yield and ignores the mortgage that is in place. The gross yield tells you the cash that the asset is generating. To figure out how your equity is performing, you need to adjust for the debt that was used to purchase the property. Let’s adjust for interest and debt. Net Realizable Value of $850,318 less debt of $250,000 gives $600,318 net realizable equity value. The equity is the value of “your money” in the deal. Note that the 3.1% return on equity (above) does not take into account Income Taxes (federal and state) that would be payable on the net income. I know that the owners have an average income tax rate of 25%. With real estate, your taxable profit is reduced by depreciation charges. So you take the net profit after interest and depreciation ($4,476) and multiply by your tax rate (25%) to get taxes payable of $1,119. 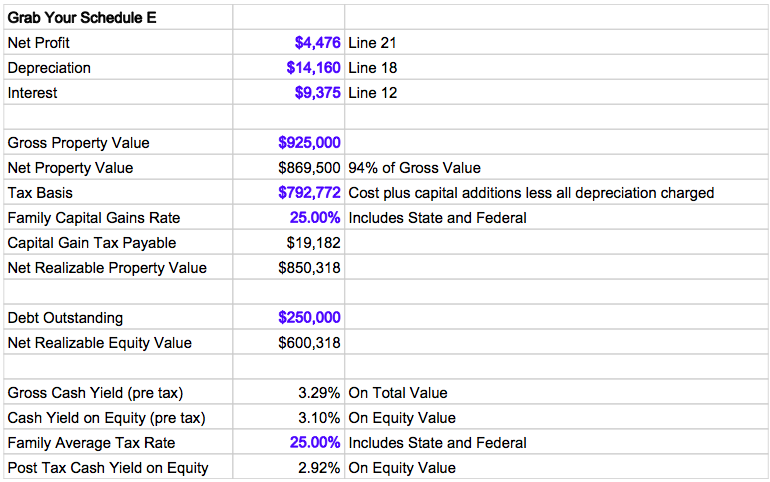 Income taxes reduce the return on equity to 2.9% – calculated as ($18,636 – $1,117) / $600,318. If you are able to hold for a long time then property can be a tax effective way for you to invest your money. Note that, in this example, the effective tax rate is 6% ($1,117 / $18,636). Remember to estimate your taxes on the income after interest and depreciation. Now you have the financial information required to consider the deal (buy, hold, sell, refinance). What are the family’s overall financial goals and how does this property fit into these goals? How large is this asset class as a percentage of the family’s total balance sheet? What are the alternative uses of the equity in this property? Are there debts that cost more than this property is yielding? Are there large capital sums that will be paid in future years (roof, structural, local energy regulations)? If yes, then consider if you need to adjust value or increase future expense budgets. Consider the sustainable yield. Know that by adding back the depreciation, you have made an assumption that you won’t have to replenish the building any faster than your current year repairs budget. If the current year was a light expense year then are fooling yourself on the true yield that you’ll be receiving. Ideally, you will have done ALL these calculations BEFORE you bought the property. If you did the calculations then pull them out and compare your budget to actual experience. Update your numbers each May and track your investment over time. You can find more about property investing in my free book available for download here. If you’re curious about my thoughts… I like this deal because it sits beside a downtown core with strong economic growth. It’s yielding nearly 3% after tax and has excellent prospects for continued capital growth. Down the road, owners can retire to this property, rent out one of the units and live in the other at a low net cost. This entry was posted in Uncategorized and tagged family finances, finance and investing, financial education, personal planning, real estate investing by Gordo Byrn. Bookmark the permalink.